What are the Non-Destructive testing methods? The components that we design and engineering should satisfy the service and the requirement. For that, engineers make sure that the finished product should be tested before it is going to be installed and start functioning. Engineers employed few testing methods both destructive and the non-destructive tests of the materials. Let’s discuss what are the different types of Non-Destructive testing methods. The Non-destructive tests are employed for the finished products. The finished product which is under Non-destructive testing will not be subjected to the fracture. The Non-destructive test intended to know the internal defects and surface defects of the finished product. The range of the NDT tests is wide varying from visual examination to radiography and even ultrasonic tests for the finished products. The commonly used Non-Destructive testing methods are listed below. The defects can be found on the finished product by the naked human eye or little magnifying lens. This is called the Visual inspection. Such as surface defects and the dimensional accuracy, Penetration in the welded joints can be visually inspected in Visual Inspection method. The cheapest and the simplest test among the NDT tests for the surface defects. A liquid with low viscosity will be poured on to the surface of the finished product to inspect the defects. 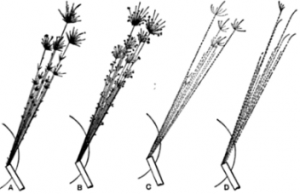 As shown in Fig a. This Liques called as the Penetrant. This liquid will be penetrated into the cracks due to the capillarity action. This test can be used for the metal and non-metals such as the ceramics, plastics and glass. Fluorescent is the most used penetrant. The magnetic detection test is used for detecting the surface flaws in the ferromagnetic materials and alloys. In this test, the component is going to be magnetised first. Due to the presence of the cracks on the component, the magnetic flow lines will have the irregularities. At these cracks, the gap will act as same as the gap between the S-N poles of the two magnets. Due to this phenomenon, the iron or the dust magnetic particles on the surface will be collected at this cracks. and reveals the presence of the cracks in the component. This Magnetic detection test is employed for fatigue cracks. This test is only suitable for the ferrous metals only, due to some complication in the other materials. So, what are the ultrasonic waves? Well, Sound waves with the frequency beyond the audible range are called ultrasonic waves. The audible range is greater than the 20 KHz. The principle of the Ultrasonic testing of material is that the materials defects will be observed by the by the way in which waves are transmitted through the metal. The frequency range used for this test is from 0.5 MHz to 10 MHz. In this test, Pezo electric material used to generate the Ultrasonic waves and sent them through the component which needed to be tested and observes the waves reflected back by the defects in the component. Radiography is specially used to locate the internal defects in the forgings, welded joints and the castings. In this test, We use x-rays, γ-rays to detect the internal flaws in the component. These rays can penetrate thru the solid materials, and some of the rays will be absorbed. These will be readily detected on the photographic film placed on the side of the material opposite to the source of rays. Spark test is a kind of destructive test. But it is very quick and inexpensive. This test is used to determine the classification of the ferrous metals. In the spark test, the component will be touched to the grinding wheel to observe the spark it produces. These sparks will be compared with the chart or to sparks from a known test sample to determine the classification of the material. A scrap material will be used as the testing specimen, not the final product. 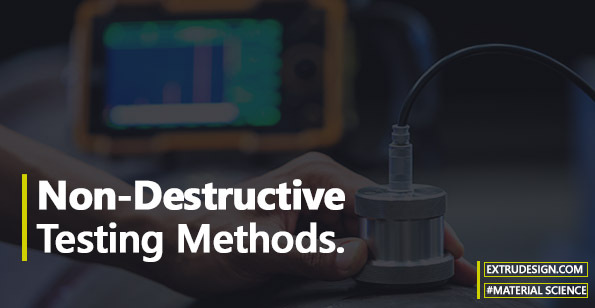 We have discussed what are the different types of the Non-destructive testing methods and along with the explanation of each method individually within this article. If you have any thoughts please let us know in the comment section below.